I'm a fan of That Guy With The Glasses: he's a funny dude, and anyone who has Brazil as one of their twenty greatest films is alright. Come 19th January, though, comes the single review I'm simultaneously anticipating and dreading: The Nostalgia Critic reviews Conan the Barbarian and Conan the Destroyer. Witnesses to The Siege of Van Ostrand will know how nervous I am about this. The Critic is generally thorough in his research, although his greatest snafu--where he jokes about Mako's voice in a role sounding "like he smoked a million marlboros a day" unaware that the actor was suffering from oesophagal cancer during the recording--caused quite a bit of controversy. I dearly hope the Critic has the right sources, and that we won't have to order another assault in such a short time. Still, even if NC trots out the same old nonsense, I doubt he has the malicious intent Van Ostrand did, and would be perfectly willing to apologise for anything he gets wrong, as he did with the Mako incident. Until 19th January, I'm hopeful. 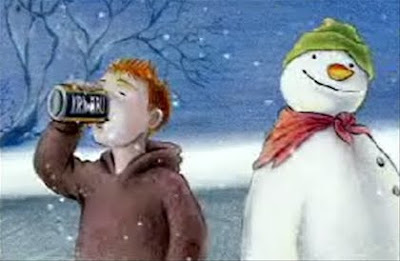 I still don't know why I celebrate Christmas. It's such a bloody hassle getting the dinner organized, strategically mobilizing the presents, and dealing with the madness of a West Coast family. Still, for all the trials and tribulations, it's great being with the family, and spending a bit of time to appreciate them. Unfortunately, it means I've been a bit light on the posting this week, but I'm sure you'll forgive me. Savage Sword's "Worms of the Earth"
As I’m sure you will appreciate, Christmas over here in Bonny Scotland has veered between the agony of organizing an efficient Christmas dinner & present delivery route, and the ecstasy of knowing the madness is over for another year. Thus, I thought it an idea to stick to something cheerful and enthusiastic. Generally, Howard fans have been blessed and cursed with adaptations. The films (which may or may not include Conan the Barbarian depending on your view), the cartoons, and the television series would naturally be considered on the “curse” side of things, but what of blessings? By far, the most numerous and accurate Howard adaptations are found in comics. The Dark Horse comics have their hits and misses, and while they are more faithful in some ways, they unbalance that with some annoying and sometimes baffling divergences of their own. In my opinion, Roy Thomas is the most consistently successful translator of Howard into a new medium, all the more effective when you have the likes of Barry Windsor-Smith, John Buscema and Gil Kane on the art side of things. He isn’t beyond reproach by any means–there are a great many of artistic or narrative decisions that just plain bug me, even in his Savage Sword adaptations–but his mantra of sticking to the text as closely as possible is one that certain other translators into other mediums would do well to adopt. Diversions of the Groovy Kind has most kindly (and groovily) uploaded Roy Thomas’ adaptation of “Worms of the Earth.” Part 1 is here, part 2 here. 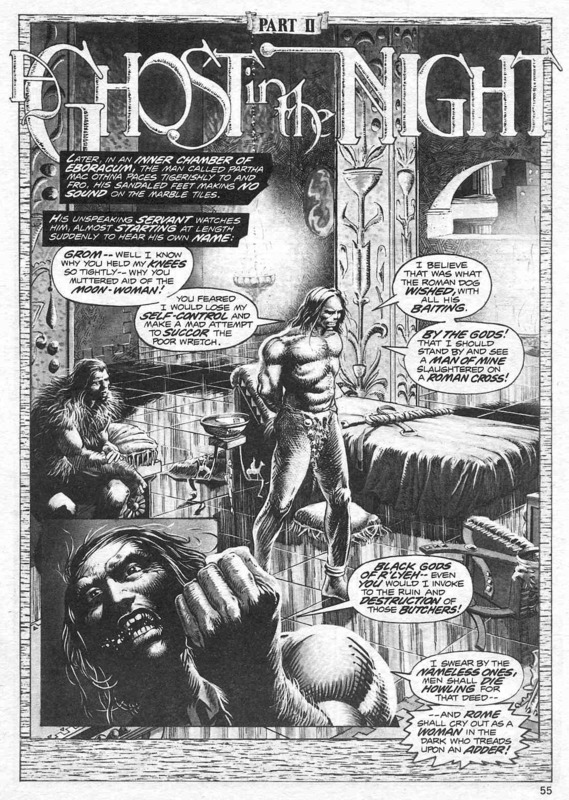 It was printed in The Savage Sword of Conan numbers 16 and 17, featuring the artwork of Barry Smith and Tim Conrad. That, ladies and gentlemen, is how you do a Robert E. Howard adaptation. The essential themes of “Worms of the Earth”: the stark, bleak atmosphere, the sense of Bran going too far in his vengeance and damning him and his entire people in his lust for vengeance, the tragic revulsion of Atla, the inhuman horror of the Worms, the haughty arrogance of Sulla transformed into pitiable madness. All are present. Every one I could think of. Some of the dialogue was adapted prose, and it works fine, just a few switches of pronouns. The descriptions are nigh pitch-perfect, the story stuck to like glue, and the narrative brisk and tight, with no extraneous pastichery. A great job by Thomas: in this case, he fired on all cylinders. The artwork, especially Conrad’s, is simply astonishing. It’s like a black-and-white film, with the contrast and mood of one of the classic 1940s horrors. The establishing shot of the crucified Pict is impressive, a real sense of scale. The vista on pages 40-41 of issue 17 is simply breathtaking. The misty, bleak, unforgiving landscape of The Hound of the Baskervilles, Kidnapped, Tam O’Shanter–and, of course, Howard’s Bran Mak Morn–laid out in a two-page spread. I love it. The depictions of the characters are uniformly fantastic. Bran is the strong king of a savage people, with a sense of darkest tragedy looming about his noble features. The other Picts we see are the stunted giants we all know and love, and Gonar makes for an imposing and otherworldly figure. The Romans combine a sense of smug imperiousness with a strength that suggests they’ll back up that confidence–a nice parallel to Howard’s own grudging respect for the Romans, despite his antipathy for them when they’re against the Celts. What I particularly love is the refusal to be constrained within the panels. The first part mostly keeps within the confines, everything contained in a box. This part, I believe, was primarily Barry Smith. However, on page 55 of issue 16, things start to change, as we’re faced with action bleeding out of the boxes. Page 58 is a riot of sweeping greys, stark whites and hellish blacks, amply illustrating the chaotic fury and frustration of Bran, faced with the Devil and the Deep Blue Sea. Page 39 of issue 17, a “previously on…” catchup, has Bran’s spear and horse encroaching over the exposition, providing a sense of immediacy even with the necessary considerations to new readers. Page 45 starts to play with panel shapes, with two quarter-circles in the bottom. Page 48 has one of the most ingenious uses of Howard’s dialogue incorporated into the very construction of a page I’ve ever seen: four panels, arranged in a semicircle, echoing that same masonry described in the text! Absolute masterpiece of textual and image synergy. 49 continues the technique, this time inverted, to mirror Bran’s descent into the underworld. 51 has Bran dominate the page in style, by physically clutching two foreground panels, thrusting them aside roughly and confidently, like the door to Atla’s hut–as indeed he does (thematically) in the text. Yet another masterstroke. Ah, but the moment we meet the Worms on page 53… This is sequential art. The loathsome, serpentine forms of the Worms gather around Bran. Indeed, the panels are arranged in a spiral: Bran is trapped in the center of a veritable whirlpool of horror and nightmare. Then, page 54, the entire page–what would normally be a pleasant white–is pitch black, punctuated by the mad, distended eyes of the Worms. The five lone panels are enveloped by this swamp of darkness and glittering eyes. It’s an excellent use of panels–and breaking them. Absolutely brilliant. When Bran comes upon the ruins of the Roman fort, the lone survivor’s recount of the horror is in distorted, cloud-like panels, like the design used to indicate thoughts or dreams. Soon, that cloudy shape distorts into a melting, disintegrating mess, until the survivor dies. Finally, the great confrontation with Bran and the Worms – again, excellently drawn. The final three panels overlap each other, suggesting the haste of Bran’s flight from that insane episode, pushing the terrors behind him as he rides into the night. The good webmaster of “Diversions of the Groovy Kind” considers this second only to Thomas’ and Windsor-Smith’s adaptation of “Red Nails”. I respectfully disagree, as this, to my mind, blows the excellent “Red Nails” right out of the water: the artwork, the exemplary translation, and the clever use of panels just show how incredible Howard comics could be. That’s not to say it’s perfect. It isn’t: there are two major flaws with the adaptation. First, Atla. The depiction here is far too grotesque, an outlandish exaggeration of the unloveliest aspects of her description. She also looks too old and hag-like: Atla was specifically stated to be “not old”, but with the weight of great age on her shoulders. Her reptilian & Wormish aspects are only noticeable up close, as Bran finds out. That’s what makes her such a horrific character, in my mind, the dichotomy of the beautiful and the hideous. Poisoned Honey. Taking away her youth and subtle attractiveness until the final revelation somewhat dilutes it. The second is that the Worms are revealed too completely, too soon: it ruins the revelation at the end, and much of the horror is somewhat neutered. A single flash revealing semi-obscured features would’ve been so much more powerful. I do feel these problems let the comic down substantially, but not quite enough for me to stop fawning over it. After all, just about everything else is pitch perfect: though it would be remiss of me to not comment on the faults, neither shall I totally condemn it for them, even with their relative magnitude. This comic shows exactly why I have no time for the “Howard is too difficult to adapt” crowd. Give me one good reason, one, why this story wouldn’t make a solid film, or an episode of an anthology series. It’s cinematic, it’s powerful, it’s multi-faceted and multi-layered. I’m not going to be making any bold statement when I say that, if any one story could be considered Howard’s best, “Worms of the Earth” is a worthy contender for that title. There is absolutely no reason to change this intelligent, atmospheric, frightening, exciting, brilliant tale, as Thomas’ adaptation (for the most part) illustrates. 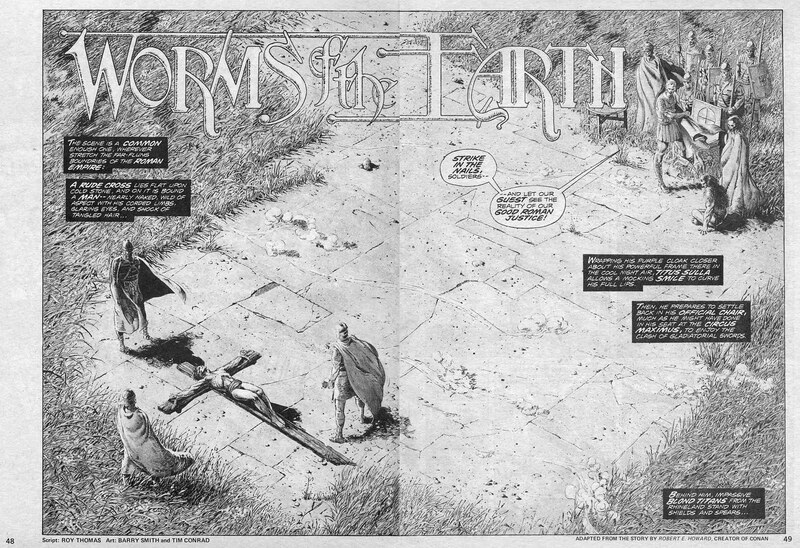 Even beyond the fact that “Worms of the Earth” is faithful to the story in a way no film or television adaptation could even dream of approaching, the very style and construction of the comic is bold and pushes the medium to the limits. A film based on a Howard story cannot merely adhere to the text, and presume to be any good: a director must be willing and able to use the power of cinema, to be as inventive and striking as Howard’s own prose. It would be pointless and counter-productive to ape Conan the Barbarian or 300, or even Alexander Nevsky. Howard deserves more than a routine genre movie. You filmmakers working on the film adaptation of Bran Mak Morn, take note. The new Conan film will not be The Hour of the Dragon. The new Solomon Kane film will not be “Wings in the Night.” You have a chance to make “Worms of the Earth.” Don’t be like Doppenheimer or Bassett, making a superfluous origin story that ignores Howard’s meticulously crafted words, with characters and stories alien to his creations. Thomas showed a near word-for-word adaptation was possible. Make your film Bran Mak Morn. Make it Robert E. Howard. Make it great. 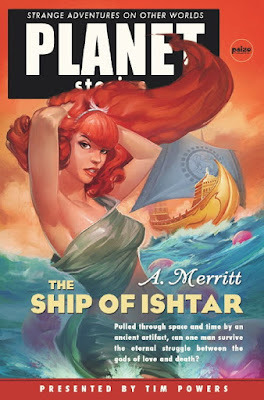 Strength of the Sea: The Ship of Ishtar on Dial P for Pulp! 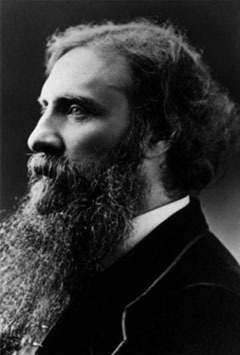 Abraham Merritt is criminally underexposed to modern audiences. Considering his impact on the pulp juggernaut that is the Weird Tales Trinity, it’s a bewildering state of affairs: even Blackwood, Machen and Dunsany seem to have a greater following, with more recent reprints than Merritt. In addition, he was one of the select few to collaborate on the legendary round-robin tale, ”The Challenge From Beyond,” with Howard, Lovecraft, C. L. Moore and Frank Belknap Long. The most recent release I can find of Merritt’s work (apart from the aforementioned “Challenge”) is a reprint of "The Metal Monster" in “Lovecraft’s Library,” a series that seeks to hook the Lovecraft fan-base into reading the material which fired the Man from Providence’s imagination. As an aside, who else would like to see a “Howard’s Library,” featuring Lamb, Mundy, and other under-appreciated authors? Luckily for Merritt fans, Paizo came to the rescue. 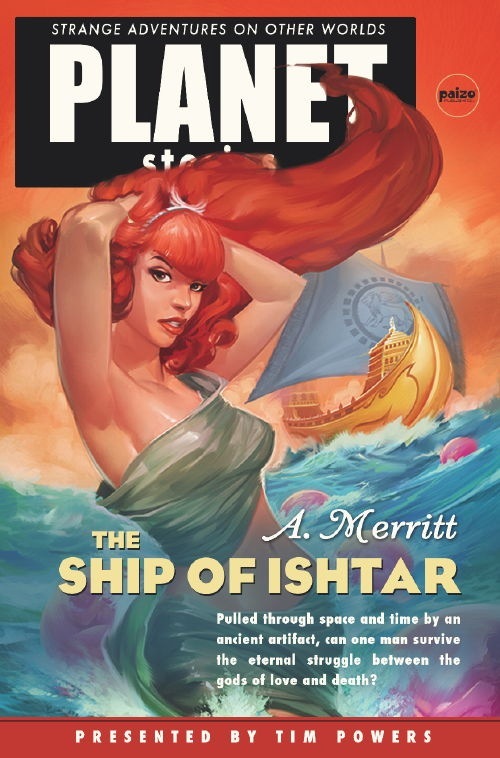 Paizo’s Planet Stories series consists of some of the best pulp fiction of the early 20th Century, some of which hasn’t been reprinted in decades. From the redoubtable Robert E. Howard, to early stalwarts Henry Kuttner, C. L. Moore, Otis Adelbert Kline and Leigh Brackett, to modern contributors Michael Moorcock & Gary Gygax. Future additions include Manly Wade Wellman and Piers Anthony, and hopefully even more in the years to come–especially more A. Merritt. S.H.I.E.L.D.W.A.L.L. Operation Defenestration - SUCCESS! Operation Defenestration is a complete success. Although Ms Van Ostrand's essay has not been removed from Fandomania, it has been effectively neutralized by an Editor's Note detailing the controversy. Labels: Criticism of Robert E. Howard, Reputation of Robert E. Howard, S.H.I.E.L.D.W.A.L.L. The Enemy has many faces, some connected, some sprouting from the quagmire of intellectual pretension independently. Regardless of the origin, the heads of the Enemy must be relieved of their shoulders. Howardom has advanced far in the past few decades, and we cannot allow the old mistakes, myths, misinterpretations and outright lies to gain a foothold. Your orders: review Margaret Van Ostrond's essay "Was Conan the Barbarian Really a Fictional Character" and post your response in the comments section. Van Ostrond's poisonous, sensationalist tract must be destroyed and discredited as the sub-literary hackwork it is. Many allies of S.H.I.E.L.D.W.A.L.L. and fellow proponents of The Cause have made their presence known: Damon Sasser, Scott Oden, David Gentzel, Dennis McHaney, Frank Coffman, Rob Roehm, Scotty Henderson, James Reasoner, Lisa Tomacek-Bias, and the mysterious al-Harron. S.H.I.E.L.D.W.A.L.L. 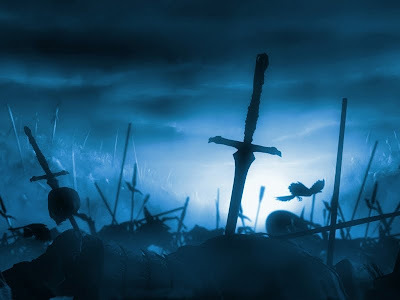 are the front line in defense of Robert E. Howard, and we must lead by example. Suffer not the hack to lie. Labels: Criticism of Robert E. Howard, Ranting and Raving, S.H.I.E.L.D.W.A.L.L. As I've mentioned more than a few times, I quite like Conan the Barbarian. It ain't Howard, it ain't Conan, but it's a fun film. Great music, good set & costume design, good acting by the actual actors James Earl Jones and Max Von Sydow, a real atmosphere of a ruder, barbaric time. I'm always willing to defend it on the grounds that it deserves, despite it being about as Conan as Ally-Oop. However, I'm not going to defend it for what it isn't: a good Howard film, a good Howardian-in-Spirit film, or a good Conan film. What brought this on? This post. I neglected to put a Triangulation post for last week, sorry 'bout that folks. You know what I did this morning? I played the voice of a toy. Some terrible robot toys from Japan that changed from one thing to another. The Japanese have funded a full-length animated cartoon about the doings of these toys, which is all bad outer-space stuff. I play a planet. 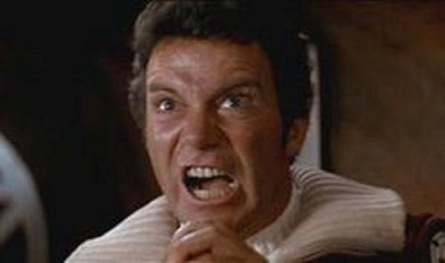 I menace somebody called Something-or-other. Then I'm destroyed. My plan to destroy Whoever-it-is is thwarted and I tear myself apart on the screen. You know, it only just occurred to me that despite being listed third of my main interests up underneath the blog's title, I haven't really talked about Transformers that much. I'd been meaning to, though, especially things that I've noticed few really talk about: the themes, history and metaphors of the Transformers. Most people tend to dismiss the Transformers fiction as little more than a soulless means of advertising an increasingly commercialized childhood, and that's certainly how the comics and cartoon came into being. However, the various writers took the inherently surreal SF mantra of gargantuan robotic organisms that, somehow, transmogrify themselves into vehicles, and they ran with it. Bob Budiansky & Simon Furman are probably the most famous of these, the latter in particular famed for bringing some much needed explanations & gravitas to a setting that could so easily have become a campy, trashy mess. Recently, the Official Conan forums had been discussing a second leaked script for the upcoming Conan film. There were a number of differing details within the script, but nothing that saves it from the mediocrity of the previous iteration. In regards to any illegal links - such as links to the new Conan script - and all snippets that have been obtained illegally have been removed from this site. Posting illegal links is a forum violation and will be result in official warnings that may lead to suspension/banning from the site. Snippets obtained from such illegal links will also not be tolerated. All such posts have been removed or are in the process of being removed. Worrisome news. Such a post and mass culling of messages did not occur when the first script was released, nor for the Solomon Kane script: there were reminders, but I don't recall messages being deleted as well. I don't hold the Mods or Admins, ever tireless and beyond reproach as fans, responsible for this. 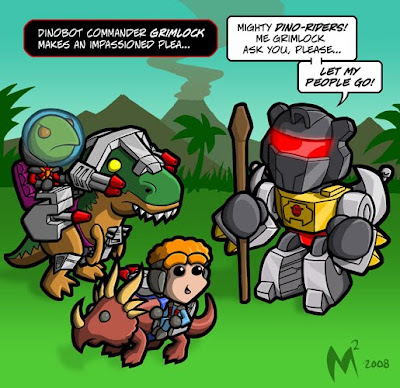 This is clearly the doing of CPI/Paradox. Why now? I'm guessing the script is fairly close to the final draft. That bodes ill for the film, since outside one or two "improvements" (or rather, excisions of particularly odious elements), the script is no closer to Howard than the original was. This is the first time something like this has happened on the forums, to the best of my knowledge. I really hope it's the last. *Edit: originally, I called the mods "tiresome", when I meant "tireless": a very funny slip of the tongue in retrospect, but I certainly didn't want to offend any of the fantastic fellows bearing the Twin Spears of Moderation. You guys are great! **Edit the Second: It has been made clear that CPI/Paradox were acting at the behest of Lionsgate. Damn you, Lionsgate! After a veritable hurricane of posts (by my standards anyway), I've kinda burned out a bit, so only one this week, about the upcoming Discworld fan film. I really dislike shallow parodies. They bug the hell out of me. Now, I like Terry Pratchett's work, even if I've only read the first half of his ouvre (and The Last Hero), but to be frank, certain aspects kind of rear their ugly head. One is Hrun the Chimerian: a big, dumb barbarian with a magic sword from a Land of Mists which "only exist to produce heroes" who is involved in much derring do. Now one could make the point that Hrun is a parody of pastiche or movie Conan, or the poorly-disguised Conan clones who transplant only the surface elements, but it's pretty evident Hrun is meant to be Conan himself. Thus we get lovely phrases like "The strength of twenty men, the speed and agility of a black panther and the intelligence of a garden snail." Honestly, if you're going to go to the bother of parodying Conan, then at least parody him right. Musclebound, hulking numbskulls just doesn't cut it: that could describe dozens of half-price barbarian protagonists. Luckily, Pratchett got more involved with his next Conan-alike in Cohen, though there are still a few annoying things like the permanent loincloth. I don't know, maybe it's iconoclasm for the sake of iconoclasm. Gentlemen, we have another new agent of S.H.I.E.L.D.W.A.L.L. joining us today. As with Agent Theagenes, Agent Scammonjam had him under observation for some time, and is assigning him to the main division of S.H.I.E.L.D.W.A.L.L. Agents. Agent Le Vyonnaise' role will be the search for news and information pertinent to The Cause. While it is the duty of all S.H.I.E.L.D.W.A.L.L. agents to be ever watchful of such matters, Agent Le Vyonnaise will be primarily active in this regard. All agents are encouraged to peruse Agent Le Vyonnaise' MINAC reports, the first of which, Assignment P-7920, has been delivered to S.H.I.E.L.D.W.A.L.L. HQ and disseminated online. Assignment P-7920 reports on Scott Oden, ally of S.H.I.E.L.D.W.A.L.L., and the release of his new book, as well as Tantor Media's release of Kull - Exile of Atlantis in audiobook form, The Men Who Made Argosy, and the latest work by Steve Jones. We at S.H.I.E.L.D.W.A.L.L. welcome a new shieldbearer to the cause, and look forward to what he brings to the game. Although I made my official Cimmerian debut last week, this is not the first time the name Al Harron has appeared on this site. A little yarn by the name of El Ingenioso Bàrbaro Rey Konahn de Simaria was unleashed on the unsuspecting website, causing a bit of a ruckus in its shameless parodying of Milius’ film. This story means immeasurably more to me now than it did when it was written, since it was the basis of a connection between myself and the late Steve Tompkins. Even at the time, the playful, tongue-in-cheek praise he espoused for my little tale was an incredible source of confidence, and knowing that this is the last communication between the two of us until the Valkyries come for me, I wish to share my own thoughts on a man whose brilliance has illuminated so much. As a latecomer to Robert E. Howard studies, I have been fortunate to have a huge catalog of past essays to discover. Going through tomes of scholarly criticism such as The Dark Barbarian, The Barbaric Triumph, The Hyborian Heresies and others, I was enthused by the sheer range of Howard scholars, how their views, backgrounds and personal history could all be so different, yet find a unifying quality in a writer from Texas. Though I found every writer fascinating, Steve Tompkins in particular intrigued me. Though half a world apart and twice my age, I believe that had circumstances been different, I would have met him, we would have talked and laughed and disagreed violently, but always coming away with a new view, discovery or appreciation of the subject discussed. I have no doubt in some multiverse, Tompkins is yet on Midgard, and an alternate version of me would have a chance to talk to him in person, and thank him for what he has done for Howard studies, Howard fans, and myself. Since reading my first Tompkins essay, “The Chants of Old Heroes, Singing in Our Ears,” I knew he was someone special even in the field of Howard studies. I went out of my way to find anything he wrote, scouring the internet for more. Be it in celebrated, Cimmerian Award-winning pieces like “The Shortest Distance Between Two Towers,” rousing rallies like “Pan versus Peter Pan,” or sly homages such as “Night Falls on Whoheim,” Steve Tompkins never failed to enthrall, and his works remain a testament to his incredible mind. Perhaps one of my favourite Tompkins pieces is “What A Mummer Wild, What An Insane Child,” a surprising discussion on the similarities The Dark Knight shares with Howard’s fiction. This, I believe, encapsulates Tompkins at his best: he convincingly explores how far-reaching and universal Howard’s themes are, beyond the mere blood-and-thunder boy’s fantasy many a critic accuses him of. The subcutaneous truths of barbarism’s war against civilization in society and the individual, humanity’s defiance against cosmic indifference, and the battle of hate and death are so strong that they can be seen in all manner of films that one would not normally associate with Howard. Above all others, Tompkins showed me that Howard is relevant, his themes are relevant, his words are relevant: they can be felt in mythology, the ancient sagas, in legend, in modern fiction, and even in modern blockbusters. For inspiring that realization to me through his work, I will forever remain in his debt. I think an introduction is in order: my full name is Alexander James Harron. Though a relative newcomer in the vast field of Howard studies at 25 years of age, few authors have galvanized my imagination quite as much as the Man from Cross Plains. As a young boy, I devoured adventure fiction: Burroughs, Haggard, Conan Doyle, Stevenson, Dumas, Verne and Wells were my inspiration, the lost worlds and grand struggles of history my tonic. I also read Almuric during this time, then unaware that the author of one of my favourite books wrote anything else. Soon I would discover Tolkien, Moorcock and Le Guin, but finding other such fantasy fiction lacking I almost gave up on the genre entirely, until I picked up a copy of Gollancz’ Fantasy Masterworks collection of the original Howard Conan tales. Through Conan I discovered the vast field of Howard’s writings, and it is by way of REH that I found the other great writers of the Weird Tales era: Smith, Merritt, Moore, Brackett and others. So what can this upstart from Scotland offer to the study of a dust bowl period Texan author? Well, my exposure to Howard has been relatively bereft of pastiche material: I neither watched the films, nor read the Lancers and comics until after I had the fortune to read the Del Reys. 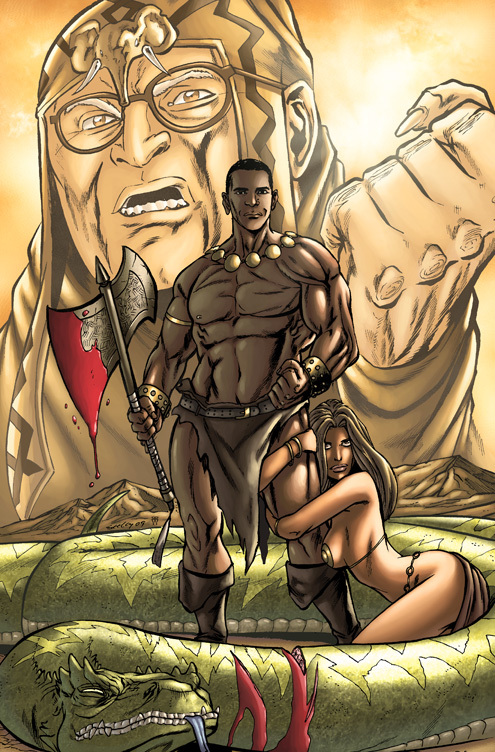 Arguably my first experience of Conan was the recent animated series Conan the Adventurer, though considering Robert E. Howard did not receive so much as a credit (nor did he deserve the shame) I would confidently call The Conan Chronicles my first “true” Conan experience. Whether this shaping results in new insights or just the reanimation of dead horses to flog anew remains to be seen. So let’s jump right in.